Combine strawberries and sugar in a pint glass. Cut lime in half. Slice one half into quarters; add quarters to strawberry mixture. 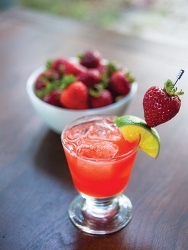 Squeeze juice of other lime half into strawberry mixture; discard squeezed lime. With a muddler or wooden spoon, muddle strawberry mixture until well blended and sugar has dissolved. Add gin to glass; cover glass and shake well for 30 seconds. Pour strawberry mixture through a strainer evenly into 2 glasses. Add ice to each glass; top each glass with ¼ cup soda water. 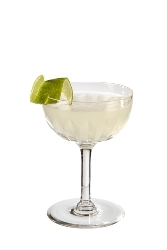 The Gimlet was invented by the British Navy to help fight scurvy! Chill a coupe glass by filling it with ice and cold water. Add the Roses lime juice and gin to a shaker, fill with ice and shake. Strain into a chilled and drained couple glass. Garnish with a lime wheel. Chill a coupe glass by filling it with ice and cold water. 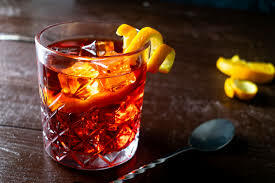 Pour the gin, vermouth and Campari into a mixing glass. Add ice to the mixing glass and stir. Strain into a chilled and drained coupe glass. Twist the orange peel over the drink to express its oils, then place the peel in the glass as garnish. Add ingredients to a shaker with ice. Shake and strain over crushed ice in a double rocks glass.